For folks who want to drink alcoholic beverages at Chinese restaurant such as Dim Sum House, the choices can be tricky. Most Chinese eateries—Mandarin in Bountiful being one distinct exception—don't offer much in the way of cocktails, beer or wine. Dim Sum House actually does have a small wine list with brands like Kendall Jackson, Chateau Ste. Michelle, Kenwood, Fetzer and Bella Sera. And there are the usual beer suspects typically found in Asian eateries: Sapporo, Singha, Tsingtao, Heineken and such. Still, my advice generally would be to BYOB, as a Chinese family did during one of our Dim Sum House visits when we noticed a case of Bud Light lurking under their table. Beer is commonly touted as the drink of choice to pair with Chinese food. And there's certainly nothing wrong with sipping a Chinese Tsingtao or a well-made American or European lager—something like Lev from the Czech Republic or locally brewed St. Provo Girl, for example. The low alcohol in most beer tends to work well with spicy foods, so a cold lager would be an especially good match for searing Sichuan dishes. The same characteristics that make lagers a great choice for Mexican and Indian foods make it an equally smart choice for Chinese cuisine. But wine-lovers needn't necessarily eschew wine when eating Chinese food, as long as they remember a couple of basic wine pairing principles. Since spicy food tends to exaggerate tannins and the natural bitterness in wine, tannic red wines will usually be a poor choice for even mildly spicy foods. Red wines will also tend to mask the subtle flavors of many Chinese dishes. In addition, when combined with hot and spicy food, the relatively high alcohol of red wine creates an inferno on the palate. So, with the exception of certain meat and duck dishes, I'd tend to steer away from typical reds in favor of lighter Rosés or even white Zinfandel. When it comes to Chinese food, generally speaking, I think pink, not red. I'd be tempted to begin dinner at a Chinese restaurant with a bowl of hot & sour or egg drop soup and a glass of sherry. For the main courses, I'd lean primarily toward Alsatian and German or Austrian white wines. Wines like Gewürztraminer, Riesling, and Grüner Veltliner are sensible choices with Chinese food for good reason. The intense, perfume-like aromas of Gewürztraminer, for example, and its clove, rose-petal and lychee flavors wonderfully complement a wide range of fragrant Chinese dishes. The sweetness of California Gewürztraminer, in particular, serves to counterbalance the heat of red chiles and Sichuan peppercorns. 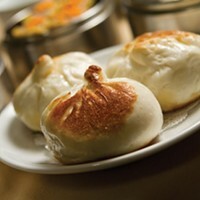 In contrast to Sichuan fare, Cantonese dishes like those at Dim Sum House are more subtly spiced and flavored. So a fruity, crisp Riesling from Alsace or Austrian Grüner Veltliner might be a better choice with the mild cuisine of Canton. Dry Grüner Veltliner is an especially vegetable-friendly wine, fairly low in acid and usually higher in alcohol than German Rieslings. So I'd team it with most asparagus, bok choy, green bean and broccoli dishes. And I'd also give it a try with simply prepared seafood dishes, especially lobster and shrimp, where the more obvious choice might be Sauvignon Blanc. Riesling and steamed pork dumplings would be a sublime food and wine pairing. Rich, meat-based dishes with dark, heavy sauces from Shanghai, like beef with broccoli or pepper beef, might be an occasion to uncork a California Cabernet Sauvignon or even a French Bordeaux. Meanwhile, Peking duck is a natural candidate for an Oregon Pinot Noir or red French Burgundy. Ganbei!